Receptacle outlet wiring for mobile homes and standard home types of receptacle outlets are essentially the same in theory but different in the techniques used to attach the wires to the device. If you notice one slot on the face is smaller than the other. The hot wire (black) always attaches to the connection going to the small slot. The neutral wire (white) always attaches to the larger slot. This is true for both styles of electrical outlets. 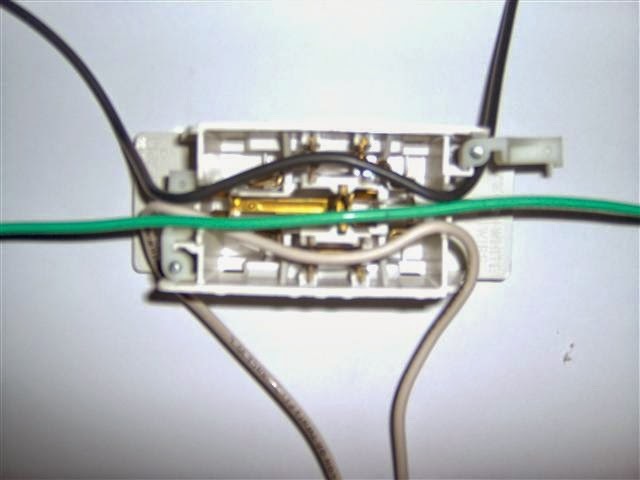 Follow these simple instructions on hot to wire a outlet and look closely at the wiring diagrams. Receptacle Outlet Wiring Standard Home Type Wires going up are feeds to another outlet on the circuit, if the circuit continues on to another outlet. If this is the only receptacle or the last receptacle on the circuit omit this. Notice you will have to make an electrical pigtail on the ground wire to get to the next device if the circuit continues on. The wires coming in from the bottom are from the power source, a homes circuit breaker box or other receptacle outlet. Be sure to strip and wrap the wires in a clockwise direction around the screws for a good snug connection. I don't like to use the "quick wiring" holes in the back as that can cause problems down the road. Strip about 6 inches of the outer insulation of the Romex cable then 3/4 of an inch of each wire to get a good connection without leaving to much bare wire exposed. Fold the wiring accordion style to get them pushed into the outlet box. Look at the pigtail wiring page for how to make a pigtail. Mobile Home Receptacle Outlet Wiring This is how to wire an outlet on a mobile home. The wiring coming in from one end would be from the power source either the circuit breaker or from another mobile home receptacle outlet. Once again if this is the only or last outlet on the circuit no wires will come out the other side. If it is the last or only outlet carry the wires through all the V slots before cutting them off to give the best connection. The things you must watch out for are to make sure that 1. You have the black wire (hot) on the small slot and the white wire (neutral) on the larger slot. The ground wire goes down the middle 2. Be sure to make a slit all the way around the wiring where they will fit into the V slots before you try to press them down. Using a pair of wire strippers makes this easy to do without nicking or what is called "ringing" the conductors. Pressing the wires into the V slots in easily done with a pair of lineman pliers. Once all that is done snap the back cover on and then insert into wall and tighten the retaining wing screws.